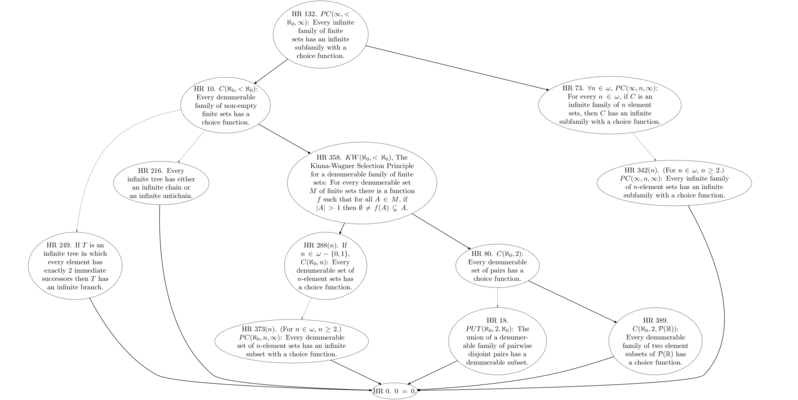 Diagram creator for consequences of the axiom of choice (AC). Enter space separated integers to get the implication diagram between the statement with these names. You can find a list of names and statements here. Hover over forms and buttons for more details. Be prepared to wait a few minutes for diagrams with over 50 forms. The Choiceless Grapher can produce any size of graph of the implication and non-implication relationships between consequences of the axiom of choice, as found in the Consequences of the Axiom of Choice Project, by Prof. Paul Howard and Prof. Jean E. Rubin. Accepted Howard-Rubin (HR) form numbers are between 0 and 430 (inclusive), except: 423, 374, 383, 360. All results visualised are results in Zermelo-Fraenkel set theory (ZF). I thank Paul Howard for providing the original implication data and the full statements of the forms, which became the fancy labels. This project's GitHub repository contains more details.